Hangin’ Tough, the boy band’s second album, spun off five top 10 singles and went on to sell 14 million copies. But NKOTB’s Danny Woods says it was far from an overnight success. Speaking of Tiffany, she’s tour with the New Kids this summer on their Mixtape Tour, along with Debbie Gibson, Salt-N-Pepa and Naughty By Nature. All four of those acts appear on “80s Baby,” one of the three new tracks on the Hangin’ Tough reissue. Joey says it’s important for the group to give fans something fresh. The Mixtape tour kicks off May 2 in Cincinnati, OH. 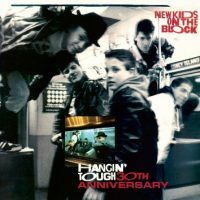 “Hangin’ Tough” (TOUGHER MIX) — previously unreleased in the U.S.
“Cover Girl” — 7” Remix – previously unreleased in the U.S.